When I thought about what geography means to me for this article, I drifted quite far back to think of this subject, or what we make of it, as being probably among the first aspects of an education we impart to children. This is a universal human practice irrespective of culture or place. From the time our ancestors were hunter gatherers in caves or in a tropical forest or savannah, all the way till the present in an urban or rural setting, just about any parent makes an effort to teach their young children the nuances of negotiating space and place. Think about it, every parent tries to ensure that their children learn to negotiate their way around their house, garden and spaces around where they live. This to me is the genesis and essence of geography – a basic knowledge of land and seascapes and their dynamic interrelationships with natural and human activity. I work in the Andaman and Nicobar Islands and have for long been fascinated by places across the islands. While I began a career in the Andaman Islands I read of historical accounts about the islands, attempting to learn of and adjust to the islands. This curiosity was spurred by hearing of various places through stories from our elderly Karen* boatmen. These men sailed with us across the entire archipelago of Andaman Islands during surveys for marine turtles, saltwater crocodiles; we also visited various villages across the archipelago, meeting people from various walks of life occupied in diverse occupations. I was very lucky to have experienced those voyages of discovery and learning by experiencing first-hand how different places harboured different habitats from thick forests and winding creeks, to mud volcanoes and different points of view from people who lived in various corners. I was enchanted with the islands ever since I heard such tales from the boatmen, which in today’s world may seem fanciful. 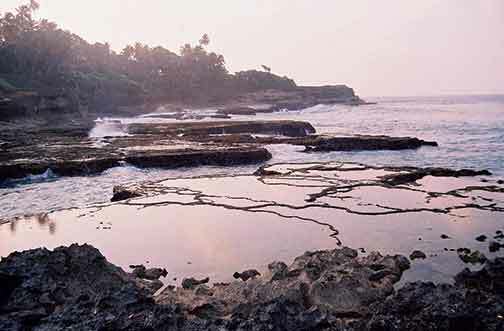 These were tales of a large bottomless water body in the middle of a forest, where logs emerged out of some deep hole during heavy monsoons; of an Andamanese hunting expedition when a wild pig and its pursuers ran into a large white cave which happened to be the skull of a blue whale thrown ashore in a storm, and of visiting the ruins of a wrecked wooden ship near a mangrove and finding gold teeth from the decayed remains of those who didn’t make it out alive. These stories also gave a context by which to understand a history of places, and that negotiating one’s way by sea, jungle or along the coast requires knowledge – island specific knowledge. As part of a team exploring Andaman natural history in the mid 1990s, one of the first things I needed to know better was the lay of the land. Being an archipelago this is even more special as land is patchily distributed as islands, criss-crossed, contoured and indented by creeks, straits, hillocks, streams, and bays. The first map I actually used was an old colonial British map used by pilots of the Royal British Air Force which was photocopied for our Research Station at Wandoor village. Our journeys had to be mapped, and when we planned our route with the boatmen, total confusion ensued given the variation in names of coastal places they knew and those marked on the map both in English and extinct Andamanese (except for well-known names of islands). Even other people I contacted in the government services couldn’t help very much as, unlike our boatmen and fishermen, none of them had traversed the islands by sea in a dinghy, but had opted to take the road or ship. This became all the more exciting for me as a novice embarking on my first voyage of two months and more at sea with my senior colleague on a survey in a dinghy with four other men. All along our route a logbook was maintained of anchorages, bays and creeks we entered. We did this based on the knowledge and skill of our boatmen and dead reckoning with our map as reference. We as surveyors kept a constant observation post, ticking off indentations in the coastline while sailing close and marked bays, beaches, creeks and anchorages on our map over the next many weeks. We returned with additions to place names in at least two local languages to the existing set of English place names. Many years later I tried to mark these numerous place names on a single map realizing that all the various ethnic identities in the Andaman Islands had their own versions of place names. So a single place could be known by two or three or more names. This got even more interesting when I added historical indigenous place names to the list with some indications to meanings as well. In the Andaman Islands, very few indigenous communities survive after the early days of colonization and conflict that decimated many other tribes of indigenous islanders. What remain of them are sparse archaeological remains and old colonial accounts of those extinct communities. Apart from these tidbits about their culture are place names that are in use even to this day largely across middle and south Andaman Islands. By adding more recent additions of place names by recent colonists ranging from Bengali, Telugu, and Karen names for fishing spots and hunting grounds to the older list of British and Andamanese place names, I could see brief snippets of cultural history and economic or geographical attributes on a single map. This is based on how they were used and perceived by various people who lived in or visited such locations over historical time. Many years later and until recently I have continued making references to place names and the lay of the islands as part of my work in the Nicobar Islands. In the Nicobars, indigenous islander communities have grown demographically and continue to adapt to change in contrast to the indigenous Andaman Islanders. What was initially mentioned briefly to me by a good friend, the late Dr. Ravi Sankaran (an ornithologist and infectious island buff), was to keep a tab on the numerous names to the entire coastline in this part of the archipelago. When I began my work with the indigenous communities, it wasn’t difficult to perceive the fast changing world they were encountering and transformations to knowledge and their experience of their own islands. While mapping locations ranging from hunting paths and journeys up creeks to sight crocodiles nesting, to walking to other villages along the coast, I soon had a long list of names for plantations, rocks and bays along the coast. These include turns in a jungle path, physical features as well as locations at sea where changes in currents are used for navigation when sailing by canoe. These numerous place names are important for local islanders as their extended families own specific plantations and tend to forest patches along the entire coastline of any island in the Nicobar archipelago for their livelihood needs – a fact that had no mention in the government records. What also amazed me in this process was the intricate knowledge of geography, ecology, and animal behaviour that was in use by a few islanders who still lived the life of their ancestors. Most of such people, both young and old, lived in far off villages without any modern amenities of communication, electricity, or shops. 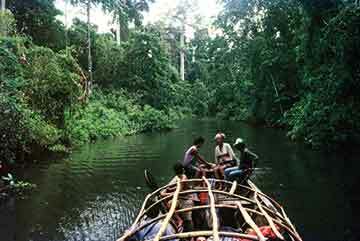 They were able to fruitfully use knowledge developed over time by their ancestors, and constantly refined through their own experiences to navigate thick evergreen rainforests on foot, a calm or stormy sea by small canoes and which fruits and tubers were good to eat and where they could be found. This is partly the essence of traditional knowledge common among various communities and its relevance to some. How does geography fit into all of this then? Firstly while traversing such landscapes knowledge of available livelihood resources is built by understanding both soils, and the kind of vegetation they support. From estuarine mangroves and abundant shellfish to useful timber that are found in the deeper forests, to locations where crocodiles nest in swamps or marine turtle nests could be found – all of these are a combination of using information on geography and natural history. While subjects taught to us at school or elsewhere are often abstractions of a particular field of expertise, a student has to be deeply curious and creative enough to imagine and understand such abstractions beyond the walls of a classroom. The experience of the young islanders I have met across my work through the last decade is different. They learn by seeing and using their natural environment for livelihood, which is not how children in cities or bustling towns live their daily lives. What is possible though is the experience of visiting locations in the local neighbourhood and surrounding rural environs given the ancient history of the Indian landscape, to recognize land formations and processes at play and hear from local people of their interpretations or even experiences with common phenomenon such as seasonal changes with the monsoon and land use and so on. Textbook information is limited by the words used, but a visual and interactive process provides a person the ability to perceive what those words mean; this is very similar to the process when a hunter takes a young novice into the forest, or a fisherman his son, to lay nets out at sea. The experience by doing and perceptive reasoning that emerges through such learning processes become both fun and instructive. Pedagogic dictates that influence the process of imparting ‘education’ will benefit a great deal from moving beyond the textbook and the curricular specifications, to spending time beyond the classroom in a more realistic setting. This will allow for sharing and experiencing geographical features and phenomena around us. For instance, while a livelihood along the coast such as fishing is significantly influenced by the tide and state of the sea, knowledge of their relation to lunar cycles and seasonal fluctuations becomes an imperative tool in the process of being able to sustain that livelihood maximally for a fisher. So too while imparting knowledge condensed within the curriculum, an exposure to the world around us in relation to what is being imparted in a classroom can achieve a lot more than in the latter alone. I believe that any such process of education has to engage as much with the real world to make it more perceptible to a student and teacher, so as to leave an impression in our minds and an ability to recognize the many natural phenomena around us in the world we live in. *The Karens are a small tribal community originally from Burma who settled in the islands in the 1920s. These elderly ‘uncles’ whom we sailed with all belong to the Karen tribe from Middle Andaman Island. The author is as a research scholar working on a dissertation on indigenous natural resource management strategies of the Nicobar Islands with the Nature Conservation Foundation for the past four years. He has been a Research Associate with the Andaman and Nicobar Islands Environmental Team for the past 18 years. His interests are in natural history, indigenous communities, and conservation of nature.